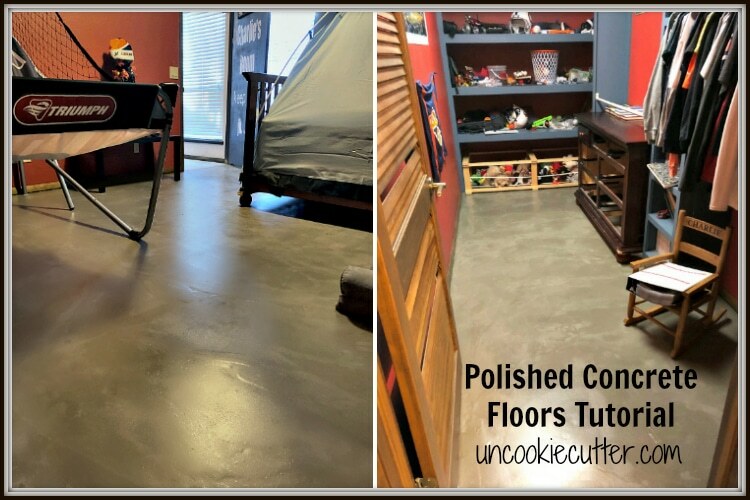 Polished Concrete Floors – The Easiest Way! I’m walking you though how I ripped up the carpet and got the polished concrete floors with no sanding, no remaining carpet tack holes and low cost! First things first, I had to get rid of the carpet. New carpet can be nice, especially when you don’t have dogs or kids. 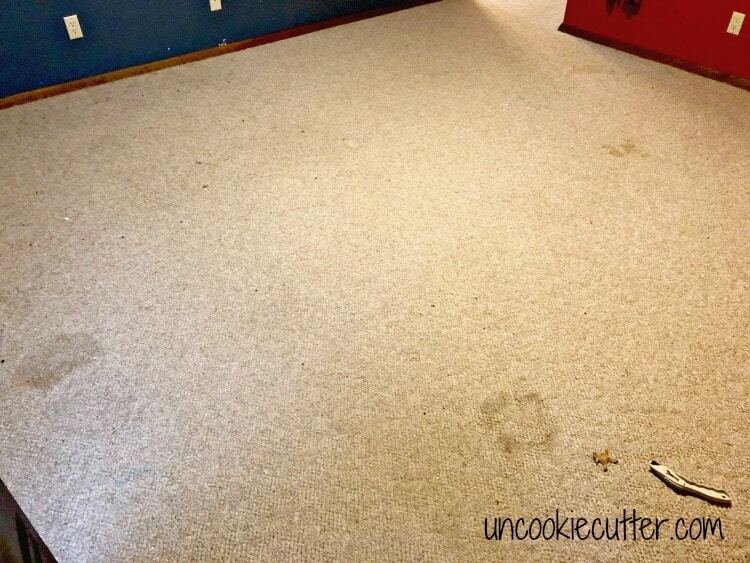 However, when you have three dirty dogs and two almost as dirty kids, 30 year old carpet is the worst. Pulling up carpet is not that hard of a task. I use a carpet knife to cut the carpet into manageable sections and pull it up. It can get very heavy, so cutting it first is much easier to me. If you have help, you may be able to roll up and move bigger sections, but I usually go it alone so cutting it was a much better option. 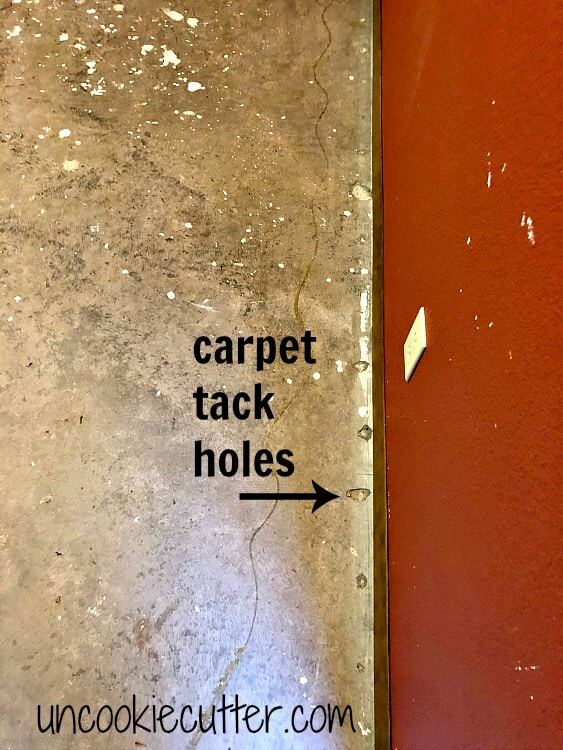 Once you have the carpet and carpet pad removed, you’ll be left with the dreaded carpet tack strips. These things are the worst. First, you have to go through and pull them all up. I usually use a flat head screwdriver and a hammer. 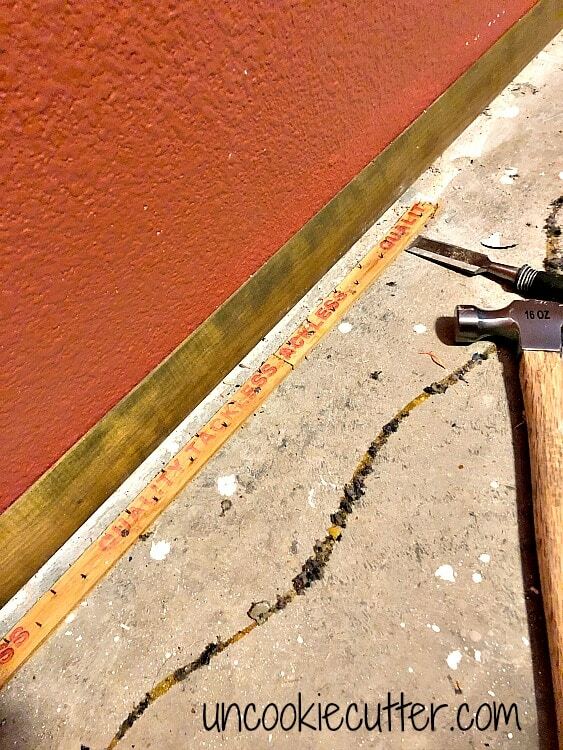 Make sure to use the hammer and pull up any remaining tacks. Once you have all this up, you are left with holes and glue everywhere. I wanted the carpet tack holes to go away in the den, so I tried filling them with concrete patch but that really didn’t work. You can still see them. So, I went I different way this time. First, I cleaned the glue off the floor. I just used a scraper for this & it came up really easily. Then I mopped the floors, ran the vacuum and mopped again. You want these babies nice and clean. Clean the holes out as much as you can and use a vacuum attachment to really clean under the baseboards. Do this or you’ll be sorry later! Once I was all done, my floors looked like this. Next I put down two layers of the concrete bonding adhesive. One gallon was plenty for both rooms. I used a paint roller to do this. It went really quickly. You mix it with water following the directions on the label, then pour it into a paint tray and roll it on the floor. I did use a paint brush to get into the corners and under the baseboards. Now comes the fun part. Okay, fun is a strong word, but fun in the sense of you are about to see the magic. I got a couple of big buckets of Quikrete Self Leveling Concrete. I used about 3 buckets per room. Make sure you get enough, buy extra if you need to and return the unused portion. The outside of the container has directions on how to mix this stuff but let me give you a couple of tips I learned. First, spend another five bucks to buy an extra 5 gallon bucket. Trust me. Add the water to the new, clean bucket first and then add concrete a little at a time mixing with a paddle mixer attached to your drill. Trying to add water to the concrete in the bucket is a nightmare and you will waste a lot of time and arm power trying to mix in all the concrete. Water first. Next, you want to make sure it is throughly mixed. Like when you think you are done, give it another couple of minutes of mixing. Make sure there are no clumps and nothing sticking to the side. Lastly, you want it to be the consistency of tomato soup. Maybe just a touch thicker, but not much. You have to work kind of quick when you get to this part, so of course I forgot to take pictures. Once I got it mixed up, I started pouring. I started in the back of the room and worked my way to the door. I laid a strip at a time and used my trowel to work it under the baseboards and into the corners. Even thought it is “self-leveling” I had to work it a little bit. It was pretty easy though. 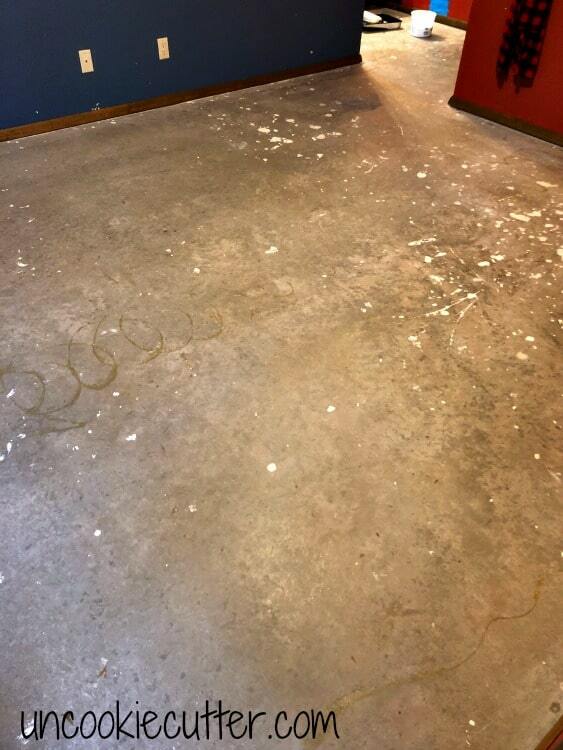 And it flowed super nicely into the carpet tack holes, making the floor look seamless! 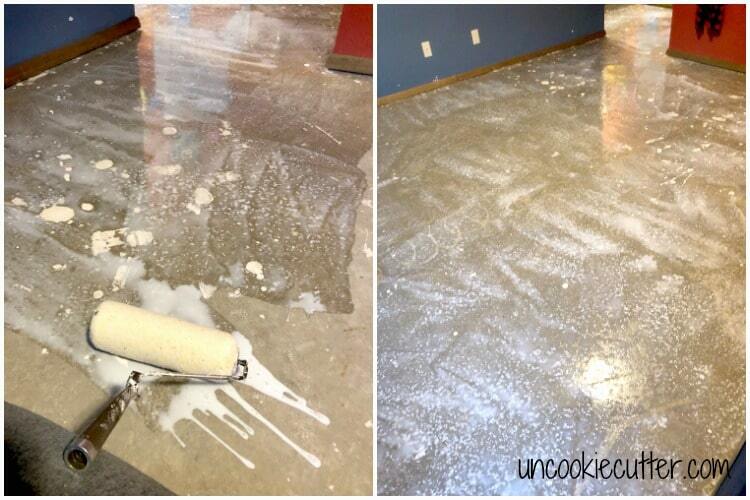 Work quickly, smoothing as you go until the entire floor is covered. I’m going to work my way into the den, so I didn’t worry about the transition, however if you want a clear break, make sure you put a board or something hard and straight down to stop the concrete. 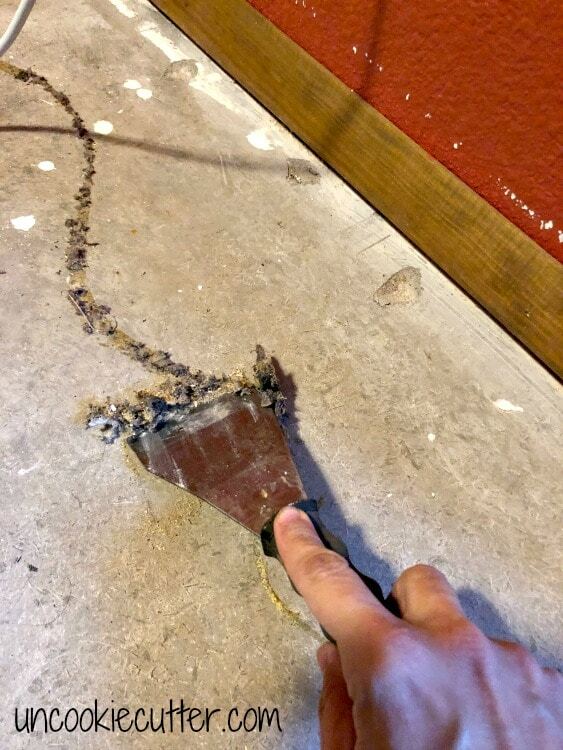 This concrete is very thin, so whatever you do put down will probably need to be temporarily attached. Let that dry overnight at least, maybe even an extra day. Then use a concrete sealer to seal it up. It was basically the same thing as the adheavise, you just don’t have to mix it with water first. I used the “natural look” sealer first but I didn’t like the way it turned out. Then I did another coat with the “wet look” sealer and it was perfect. Just pour it into a paint tray and roll it on, using a brush to get into corners and under basebaoards. Let the sealer dry up to three days if you can. I put the furniture back in the room the next morning and noticed I pulled up a little sealer in the process. I fixed it, and after a few days it was much harder and tough. 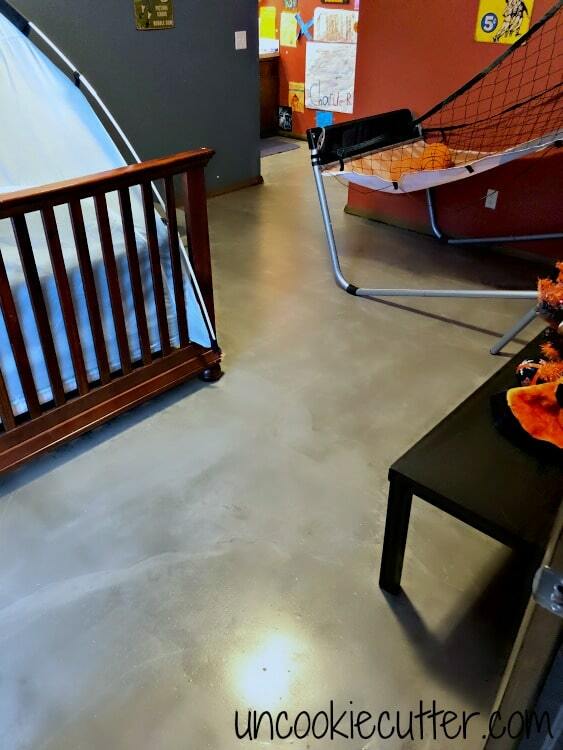 That’s it, polished concrete floors!! Honestly it was not that bad at all. SO MUCH easier than the den, where I spent days sanding and then cleaning up the disastrous sanding mess. Plus, the carpet tack holes are filled and it looks so much better!!! 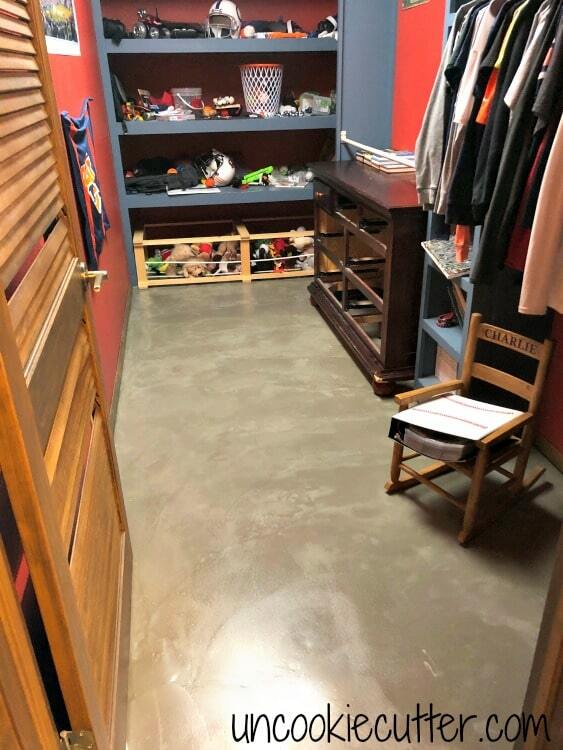 Questions about my polished concrete floors? Sound off below! « Favorite Things & Wish List 2018!